Our mission is to promote appreciation and understanding of the birds and natural environment of Coos County through education, field trips, and local restoration and conservation projects that enhance our community. The third Annual Celebration of Oregon Science is scheduled for April 20th is almost upon us. It includes a Science Fair from 12 p.m. to 2 p.m. on the Coos Bay Boardwalk. For the first two years, Cape Arago Audubon Society has participated primarily thanks to Eric Clough. Eric has volunteered to do so again by setting up a spotting scope and having some binoculars and bird books available. If you would like to join in for a couple of hours (or less), you can contact Eric at ericclough3@gmail.com or simply drop by the Science Fair on April 20th. This is an incredibly fun and popular family friendly event and we hope you'll be able to join in! April's Field trip is weather dependent but scheduled for April 27th. So the plan is to go to Mt. Bolivar at 0500 on Saturday the 27th. We have to leave early because it is a 2hr and 15 min drive to the base of Mt. Bolivar. We will also bird around Eden Valley which is nearby. This is the premiere passerine birding area in the county. Late April is a bit early to see/hear all the breeding species but is a good time to try and find Calliope Hummingbird which is a rare migrant that only occurs in this area of the county at the end of April/early May. Having good weather is important though, so we will not make the long drive if the weather is forecast to be real wet. Instead we will meet at 0700 and drive down to Powers where we can also look for early passerine arrivals. If you are interested in going call Tim Rodenkirk at 541-260-5763 by Wednesday the 24th of April. We will likely meet and carpool for both trips at the Coos Bay library. However, if you live in Coquille/ Bandon and want to meet us in Coquille at Sturdivant Park we can do that also. Once again, we will not know which trip we will do until a few days beforehand when we have an idea about how the weather will be so make sure and call Tim Rodenkirk by Wednesday the 24th. We will pick up litter on our adopted stretch of highway 42 between mile markers 2 and 3 begiinning at 12:00 NOON on Sunday, March 24th. It should not take long because "Leavin No Trace" picked up the garbage a couple of weeks ago, but there is some new trash. We will meet at the Memorial pull out across from the House of Confusion. ODOT supplies gloves, safety vests, litter grabbers and bags, so bring yourself and dress for the weather. It should be a lovely afternoon along Davis Slough. Hope to see you there. If you are interested in finding out more about Jordon Cove and its impact on the Coos Estuary, you will want to participate in the Cape Arago Audubon Society’s February activities. Our February program will feature Mike Graybill’s “Pushing the Limits of an Ecosystem: Plans for the Next Phase of Dredging and Filling in the Coos Estuary”. Our program is set for 7 PM on Wednesday, February 20th at the Oregon Institute of Marine Biology’s Boathouse Auditorium. Mike will present an overview on Jordon Cove and the dredging and filling of the Estuary. Our program will be followed by our monthly field trip on Saturday, February 23rd at 9 AM. This month’s trip will be led by Chapter Vice-President Joe Metzler to the Coos Bay North Spit, Transpacific Lane where the Jordon Cove LNG facility is proposed to be built. We will meet and hike to Henderson Marsh and look for birds along the way. As we walk to the bay, we can get an on the ground perspective of what the proposed facility would look like. And you may want to mark your calendars now for March 7th. We will joining the Coos Bay Chapter of Surfrider Foundation in presenting a workshop led by Jan Hodder on how to comment effectively on Federal Energy Regulatory Commission’s Environmental Impact Statements. The focus will be how to comment, not what to comment. Jan's presentation on effective EIS commenting will be on March 7th, at 6pm, at the Shark Bites Theater. Because of the proximity of the just completed Christmas Bird Count and our regular scheduled meeting and field trip, Cape Arago Audubon will not be meeting this Wednesday. As you probably know, our chapter meets the second Wednesday of each month and does a field trip the following Saturday. Our January meeting should occur in two days, but 80 percent of our paid membership just completed 8 plus hours of work as well as meeting this past Saturday night at our Christmas Bird Count countdown. Thus, our January meeting has been replaced with the just completed Christmas Bird Count. Thanks to all who participated in Saturday’s Christmas Bird Count. Our circle from Bandon to Coquille produced the highest number of species seen in any count in Oregon this year at 152, the only circle to exceed 150 due in no small part to horrible weather for the Coos Bay count which usually edges Bandon. Information on our February meeting and field trip will be forthcoming shortly as well as information on Audubon’s Conservation goals for the year as well as our next highway cleanup. The Pacific Coast population of the Western Snowy Plover is federally listed under the Endangered Species Act of 1973 as threatened. The Western Snowy Plover is a Bird Species of Special Concern in California. Snowy Plovers were listed as endangered under Washington Department of Game Policy No. 402 in 1981, and as threatened by the Oregon Fish and Wildlife Commission in 1975. The threatened status in Oregon was reaffirmed in 1989 under the Oregon Endangered Species Act. David Lauten has monitored the Western Snowy Plover since 1997 as part of the Western Snowy Plover working team and will be making a presentation to the Redwoods Regional Audubon Society next weekend. He will be sharing that presentation at the next meeting of the Cape Arago Audubon Society at 7 PM on November 14 at the Bandon Community Center (The Barn). The public is invited to this free event. The Cape Arago Audubon Society meeting will also include election of officers for 2018-19, information on a November 17 field trip as well as information on upcoming Christmas Bird Counts in the area. Join the National Audubon’s local chapter for Coos county on November 14th. Through the Oregon Dept of Transportation (ODOT), our Cape Arago Audubon Society adopted a mile for litter pickup. We have a two year commitment for the section between mile markers 2 and 3 on highway 42. That is along Davis Slough, providing some nice birding while we beautify the world! Our chapter name is on signs for our section. We need to pick up litter four times a year, and we have done it quarterly with March and June litter pickups. ODOT does not recycle anything, so we keep cans and bottles separate, then I recycle them. ODOT provides safety vests, gloves, litter grabbers, garbage bags, and big signs to post on the highway. On March 25th six of us, Barbara Taylor, Joe Metzler, Beverly Minn, Kent Hall, Bruce Follansbee and I (Diane Follansbee) spent two plus hours filling 16 bags of trash. That was a lot because the Coos County Corrections department had filled over 20 bags with large trash items just two days before. We found a lot of plastic and cigarette butts. Our second litter patrol day was June 16th, with Elizabeth Smith, Gene Anderson, Marie Matthews, Eric Clough and I collecting 7 bags of trash on a hot morning. That day we saw a Marsh Wren in addition to the usual Great Egrets, King Fishers, Red Tailed Hawk, and Great Blue Heron. Our next litter pickup is scheduled for Saturday, Oct. 6th beginning at 10 AM, and we need your help. ODOT prefers that I give them a list of the folks who intend to pick up litter when I pick up the signs on Friday the 5th. I know this is short notice, but please let me know if you would like to join us, so I can provide your name. At the time of litter pickup, you will need to sign a liability waiver form. You may certainly join us even if I do not know you will be coming ahead of time. We will meet at the pull out just northwest of the 3 mile marker. It is across from the old House of Confusion, and before the Green Acres turn if you are coming from Coos Bay. One of the attendees with win a long sleeved Shorebird festival t shirt from the stash of leftovers. So come join us and get a chance to win the raffle prize. Join both advanced and beginning birders alike on the Southern Oregon coast on September 21-23rd for the 32ndt Oregon Shorebird Festival. The festival, housed at the Oregon Institute of Marine Biology in Charleston, is a celebration of Oregon shorebirds and an educational experience, with field trips, talks, bird watching, and shared meals. On-line registration for the event is now open at www.oregonshorebirdfestival.org. Friday night kicks off with the author of the newly-released book “Learn the Art of Bird Photography: The Complete Field Guide for Beginning and Intermediate Photographers and Birders. Tim Boyer’s presentation will take some of the mystery and hardship out of photographing birds. Tim recently keynoted the Gray’s Harbor Shorebird Festival with his presentation “Understanding Shorebirds, The Miracle of Migration”. He will keynote the Oregon Shorebird Festival on Saturday night with an encore of that presentation. The presentation includes epic migrations like Bar-tailed Godwits flying from the Yukon Delta to New Zealand in eight days. This year’s field trips will include a pelagic trip off shore, kayak paddle tours up the South Slough and land-based trips to both Bandon and the Bay Area. Oregon Pelagic Tours will host a five-hour pelagic trip on Sunday to give participants a sense of what a day-long pelagic trip is like. South Coast Tours will lead South Slough kayak paddle trips on both Saturday and Sunday. South Slough of the Coos River is home to the South Slough National Estuarine Research Reserve which is a protected area of land and estuary. Field trips to the Bandon Marsh and Bandon Beach, the best bird watching spots in Bandon where participants can see fall migrating shorebirds. The Coos Bay field trips are also available both days where you can visit all the hot birding spots around the Bay Area. Other highlights of the weekend include the new bird display at the Charleston Marine Life Center and Shoreline Education for Awareness (SEA) leading a look at sea mammals at the Simpson Reef Overlook. The weekend kicks off with registration and check-in at the Oregon Institute of Marine Biology (OIMB) cafeteria in Charleston. OIMB is located at 63466 Boat Basin Road. Cape Arago Audubon Society is sponsoring the Festival in partnership with OIMB, the U.S. Fish and Wildlife Service, Shoreline Education for Awareness, South Slough National Estuarine Research Reserve, Oregon Pelagic Tours and South Coast Tours. Information about the festival as well as registration details can be found at www.oregonshorebirdfestival.org. Last month, under pressure from the logging industry, the Oregon Department of Fish and Wildlife Commission made an unprecedented move to reverse an earlier decision to uplist the Marbled Murrelet from threatened to endangered. This reversal demonstrated a blatant disregard for science, state wildlife law, and the continued survival of this imperiled seabird. It leaves the murrelet on a path towards extinction in Oregon. We need your help to urge ODFW to do better to protect this amazing seabird that nests in older forests and forages at sea. This takes 2 minutes! Please submit comments to the ODFW Commission to urge them to follow through on their February commitment to uplist the Marbled Murrelet to endangered. Use our form letter or customize your message to express your deep concern that the Commission reversed their decision to uplist. Click here for detailed talking points. Join us August 3 in Salem at the ODFW Commission’s next meeting to hold them accountable to their mission to protect our state’s wildlife. 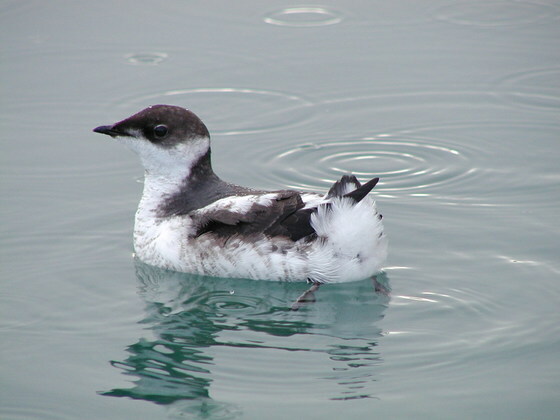 At this meeting, the ODFW Commission will review the toothless voluntary survival guidelines for the Marbled Murrelet---a virtually meaningless substitute for the mandatory survival guidelines that they would have adopted if they had uplisted the species. This is our opportunity to let the ODFW Commission know that their capitulation to logging interests in June was outrageous, to urge the Commission to follow through on their February decision to uplist the Marbled Murrelet to Endangered, and to adopt mandatory survival guidelines for this species. If you plan to attend the Commission meeting, please RSVP by contacting Steph Taylor (staylor@audubonportland.org). The meeting will be held at ODFW Headquarters. We will be in touch about meeting logistics and for potential carpool opportunities from Portland. Please wear a green shirt to show your support for Marbled Murrelet protection. Whether or not you can attend the meeting, please click here to sign on to an editable form letter. We strongly encourage you to personalize your letter. Thank you for speaking up for Oregon’s Wildlife. Join both advanced and beginning birders alike on the Southern Oregon coast on September 21-23rd for the 32ndtOregon Shorebird Festival. The festival, housed at the Oregon Institute for Marine Biology in Charleston, is a celebration of Oregon shorebirds and an educational experience, with field trips, talks, bird watching, and shared meals. On-line registration for the event is now open at www.oregonshorebirdfestival.org. Information about the festival as well as registration details can be found at www.oregonshorebirdfestival.org. Contact Harv Schubothe at (541) 297-2342 for more information. The next Cape Arago Audubon Chapter Adopt-A-Highway litter pickup is June 17 at 10 AM. Diane Follansbee is leeding this effort for our chapter. If you want to pitch in, contact Diane at dianenighthawk@gmail.com. Our May field trip has been set for May 12 to the Powers area. Most neotrops will be in by then so we should have a good variety of species. In particular we should have Lazuli Bunting and Western Bluebird. Meet at the Coos Bay library at 7 AM or at Sturdivant Park near Coquille at 7:30. we will be back between noon and 1PM. Bring rain gear, binoculars and snacks. On Wednesday evening May 9 at 7 PM, we rotate our meetings throughout the county to the Coos Bay Library. This month we will be sharing the latest information on this year's Oregon Shorebird Festival as we begin to transition it to the Southern Oregon Coast Birding Festival, to be held this year on September 21 to 23. We will also share Audubon's comments to the Department of Land and Conservation Development on the Rocky Shores Amendment to the Territorial Sea Plan. Audubon also has had some input on a proposed Bandon Beach Hotel. We will also be showing an OPB video "Shorebird: The World's Greatest Migrants" featuring Oregon Birds author John Rakestraw. SCIENCE FAIR -- Coos Bay Boardwalk, Saturday April 14th, 2018, 12-2 p.m.
Chapter members and the public are invited to participate in a Science Fair in the covered pavilion on the Coos Bay Boardwalk from 12-2 PM on Saturday, April 14 after the March For Science - Coos Bay. If anyone would like to participate or even take the lead on our CAAS table for this, please let Harv know - hschubothe@fordcommunityfellow.org . Birders in south Coos county have concluded that it is very hard to tell the difference between Allen’s and Rufous Hummingbirds and further that most of the birds they are seeing are hybrids. Researcher Brian Myers has been studying the hybrids in the area for several years. The Cape Arago Audubon Society and the South Slough National Estuarine Research Reserve are cosponsoring a free, public presentation by Brian Myers on Saturday, April 7th at 10 am at the South Slough Interpretive Center. Hybrid zones have received significant attention in biology, although few studies have investigated how behavioral traits vary across these regions of interaction. In a hybrid zone in southern Oregon and northern California between Allen’s (Selasphorus sasin) and Rufous (Selasphorus rufus) Hummingbirds, we found that hybrids vary in morphology and behavior. We will describe the hybrid zone by characterizing variation in phenotype across the area of contact, emphasizing cline analysis and courtship behavior, where hybrids perform courtship displays that incorporate different elements of the displays of each parental species. Data suggest the center of the hybrid zone spans along the coast from Bandon, Oregon, to Port Orford, Oregon, and several miles inland. Along the coast, the contact zone extends north into the range of Rufous Hummingbird (as far north as Florence, Oregon), and south into the range of Allen’s Hummingbird (as far south as Arcata, California). Few studies have incorporated analysis of the variation of behavior across an area of contact. By doing so, we add an additional, understudied layer of biology to the study of hybrid interactions. Furthermore, given the importance of evolutionary biology and its role throughout all of the sciences, we will discuss why focusing on hybridization is important, and its role in the speciation process. You are invited to Cape Arago Audubon’s presentation: “Coquille Watershed Salmon Spawning Surveys” on Wednesday, March 14th at the Bandon Community Center starting at 7 PM. Local naturalist Joe Metzler will be sharing his observations. Join Cape Arago Audubon Society’s March field trip. We will be birding Bandon on Saturday the 10th. Meet at either the Coos Bay library at 0730 to carpool or at Ray’s parking lot in Bandon, near the coffee place, at 0800. Hopefully we can find a Rock Sandpiper and relocate the rare wintering Wandering Tattler. We have plenty of places to bird around Bandon and we will try to cover as much as we can to around lunch time. Bring full rain gear, wet weather boots, water, and snacks. Call Harv Schubothe at (541) 297-2342 for details. ● On February 9, 2018 the Oregon Department of Fish and Wildlife (ODFW) Commission voted 4-2 to uplist the Marbled Murrelet from “threatened” to “endangered” under the State Endangered Species Act. This is a huge victory for this imperiled seabird. The uplisting sets in motion ODFW developing survival guidelines and an eventual recovery plan. Thanks to all of the Oregon Audubon chapters that submitted comments, signed on to letters, and provided testimony at the hearing. ● OAC meeting: Thanks to everyone for a successful meeting in November to discuss annual OAC conservation priorities. The final draft of 2018 priorities is included in this email. ● OAC chapters signed onto the National Audubon opposing efforts to weaken the Migratory Bird Treaty Act. ● Other efforts that Audubon chapters have been engaged on at the federal level include opposing weakening of Sage Grouse Protections, expanding offshore drilling on Oregon’s coast, and efforts to exempt FEMA from the Endangered Species Act. Litigation is still in process. ● Working with WaterWatch of Oregon and other conservation groups (including 8 Oregon Audubon Chapters) signed onto a letter opposing HR 4329 submitted on February 28. As currently written it places Klamath Basin birds in greater jeopardy than they already are by delivering costly and counterproductive subsidies to Klamath Basin irrigators. ● Malheur Wildlife Work Group reinitiated after a 3 year hiatus to complete remaining priorities in the refuges Inventory and Monitoring plan to meet Comprehensive Conservation Plan goals. Portland Audubon staff assisting in development of remaining wildlife survey protocols and results reporting. ● Outreach engagement in Harney County set to increase with support from High Desert Partnership including Portland Audubon. ● Elliott State Forest update: The Department of State Lands has chosen Oregon Consensus Project to outreach to public and propose people/groups to serve on an Advisory Committee to develop recommendations to manage and decouple the entire Elliott State Forest. DSL has also recently issued an RFP to hire someone to assist in development of the HCP that will be completed with USFWS. ● Congressman DeFazio has introduced an amendment onto the Department Of Homeland Security Authorization Bill that would exempt FEMA from the requirements of the Endangered Species Act when implementing the federal flood insurance program. This is targeted directly at the undermining the FEMA Floodplains BiOp, but it also has much broader implications in that it would set a precedent in terms of exempting a federal agency from the requirements of the ESA. Conservation groups in Oregon and Washington D.C. are working to get this amendment removed. Portland Audubon be sharing our Light Out materials with chapters, and working to support chapters in guiding their municipalities' LED streetlight conversion if they haven't already done so. Marbled Murrelet successfully uplisted at ODFW Commission hearing – see above. Additionally Portland Audubon, along with other conservation groups is reviewing Board of Forestry technical report regarding Marbled Murrelet protections and forest practices. ● USFWS is currently silent on the release of the new Bald Hills/Redwood National Park Condor Release Site Draft EA, which has been delayed since last fall. There will be a public comment period following the release of the draft EA. ● Portland Audubon has asked to be a signatory on MOU for groups working on condor reintroduction in Northern California. This will allow Portland Audubon to more actively participate in these efforts. Portland Audubon continues to participate in SageCon which is the Oregon effort to recover Sage Grouse. The most notable recent events involve Trump Administration efforts to review and potentially weaken protections for Sage grouse on BLM lands. ● The East Sand Island Cormorant Colony collapsed in 2016 and only 150 birds returned to nest in 2017. Portland Audubon has met with USFWS and it is unclear whether USFWS will issue permits to allow continued letal control in 2018, despite the fact that the population on the island is now far below the target set for by the federal agencies. ● Portland Audubon has produced a film about the Cormorant killing on East Sand Island which will be release later this spring. ● Focus now is on the revision of the Columbia River Salmon Protection Plan and getting the agencies to address the primary causes of salmon declines: the federal hydropower system. ● Audubon Society of Corvallis is hiring a biology intern to assist Finley refuge staff and the Valley Refuge Complex this spring. The intern will assist in grassland bird surveys, and also assist on projects at the chapter’s Hesthaven property. Final selection is in process. If determined successful, Corvallis plans to continue or even expand internship opportunities in coming years. ● HB 4105 is moving through the Oregon Legislature. It would provide $40,000 of funding to support creation of an ODFW Conservation and Recreation Advisory Committee which would continue to work on broader funding mechanisms. The bill originally called for allocating $13 million from the general fund to support implementation of the ODFW Conservation Strategy. The amended bill has strong support and is likely to gain support but represents a very small step forward. The Recovering America’s Wildlife Act dedicates $1.3 billion annually in existing revenue from the development of energy and mineral resources on federal lands and waters to the Wildlife Conservation Restoration Program. Funds in this program are distributed to the state fish and wildlife agencies based on a formula. Oregon would be able to access approximately $52 million per biennium for implementation of the Oregon Conservation Strategy, which identified conservation actions aimed at protecting 294 of Oregon’s Species of Greatest Conservation Need and habitats across the state. Portland Audubon will circulate an OAC sign-on letter. Now is your chance to weigh in and ensure that Oregon's rocky coast habitat is protected for decades to come! Oregon's Territorial Sea Plan, which has managed Oregon's rocky shore resources since 1994, is being updated for the first time in more than 20 years. Oregon's Territorial Sea Plan provides a framework for agencies to manage the coastal environment. Chapter 3 of the plan is specific to Rocky Shore Management Strategy and provides a broad plan to manage tide pools, rocky beaches, and headlands that make up Oregon’s rocky shore. This area represents 41% of the state’s 362 mile coastline. Little change has been made to this management plan since its adoption, yet the uses and threats to Oregon’s rocky environments have intensified significantly. These dynamic ocean shoreline habitats are home to a diversity of creatures living on the edge of their ecological threshold, including fish, birds, mammals, plants and invertebrates. Birds that depend on this system, like the Black Oystercatcher, need you your help to protect its habitat. Oregon will hold meetings from February through March to ask the public for their concerns and your input is needed. A full list of upcoming public workshops is available here. Please visit www.OregonOcean.info/RockyShores to learn more about this process and learn other ways to get involved. You can also submit a comment directly by emailing TSPcomments@state.or.us. The Coos Bay meeting will be on Tuesday, March 13 from 9:30 to 11:30 am at the Coos Bay Public Library. The next chapter field trip will be on Saturday February 24th 2018. This month we will venture up the Coquille Valley. Meet at 8 at the Coos Bay Library or at 8:30 at Sturdivant Park in Coquille. On Friday February 9th 2018, the ODFW Commission voted 4-2 to uplist the Marbled Murrelet from threatened to endangered status. This is a big win--it will force ODFW to immediately develop survival guidelines for the species and eventually all State agencies that deal with murrelets will have to develop management plans. Inadequate protection on state and private forest lands remains the biggest threat to the murrelet. At this month's chapter meeting, chapter president Harv Schubothe will outline all of the conservation goals that Audubon chapter leaders are working on in 2018. The meeting starts at 7 at the Coos Bay library on February 21st. 1. Create a free GBBC account if you have never participated in the Great Backyard Bird Count or any other Cornell Lab citizen-science project, or have not participated in the GBBC since 2013. If you already created an account for the GBBC in the past, or if you’re already registered with eBird or another Cornell Lab citizen-science project, you can use your existing user name and password. 3. Enter your results on the GBBC website by clicking the “Submit Observations” tab on the home page. You may also download the free eBird Mobile app to enter data on a mobile device. If you already participate in the eBird citizen-science project, please use eBird to submit your sightings during the GBBC. Your checklists will count toward the GBBC. The GBBC website is at www.gbbc.birdcount.org. All the information you need is there. Our monthly field trip is set for Saturday, January 20th. We will be birding Empire and the Charleston area. Meet at the Coos Bay library at 8 AM. In the case of weather, bring an umbrella if you bring your spotting scope dry, rain gear and a snack. We will bird until around noon with Tim Rodenkirk in the lead. Thank you to all who participated in the Cape Arago Christmas Bird Count on December 30. We found 150 different bird species during our count, the highest count in five years in near perfect weather conditions without much wind. We will not be doing a program this month as we often take the month of January off. We will return on the second Wednesday of each month and will try to make our way around the county from the Bay area, over to Coquille and back to Bandon. We will also try to make one trip up to Lakeside to keep birders in our county engaged. Finally, chapter membership dues are upon us. I will have more information from our Treasurer in a follow-up e-mail. The Coquille Valley Christmas Bird Count (CBC) (Bandon to Coquille) is scheduled for Saturday, December 30th. Call or email Harv at 541-297-2342 or hschubothe@fordcommunityfellow.org for more information. Our neighboring Kalmiopsis Audubon Society chapter in Curry County is again sponsoring the Port Orford CBC. This count, on Saturday December 17th, 2017, is centered around Sixes and covers the rich habitat diversity of Elk River, Cape Blanco, Blacklock Point, Port Orford town and surrounds. There will be no Coos Bay CBC this year. After many years our good friend Jim Rogers has passed the compiler responsibilities to Tim Rodenkirk. The Port Orford count will happen on the same date we normally do the Coos Bay count. If you know anyone in Port Orford, Sixes, or Langlois that has a bird feeder and may want to help out on the Port Orford count let Tim know and he will contact them about the easy count day and feeder watcher protocols and other information. Reach Tim at timrodenkirk@gmail.com or 541 260-5763. Cape Arago Audubon Society, Coos county’s local National Audubon Society chapter, invites you to join us at our next monthly program. We are meeting on Wednesday evening, December 13th at the Community Center (The Barn) in Bandon at 7 PM. Terry Wahl will be presenting “A Mix of Conservation and Resource Uses” on the Wahl ranch north of Cape Blanco in Curry County. We will not have a field trip in December as Christmas Bird Counts will be taking place on most weekends around the state. Marine Life Center Director Trish Mace will discuss the Center’s plans for a new bird exhibit. It will display already obtained taxidermied birds to engage both our local community and regional and national visitors in learning about Oregon’s coastal birds. The displayed birds will be a focal part of an exhibit that when complete will provide information on Oregon seabirds and shorebirds, birds seen out the CMLC windows, timing of migrations, and spotting scopes and an interactive component to record sightings made from the Center. We will also be sharing information on our monthly field trip that will follow. Call 541-297-2342 for more information about the program and other chapter activities. Tim Rodenkirk reports this morning that a Blue Jay was photographed at Barb Taylor's sister's feeder this morning. The last record of a Blue Jay in Coos County is 41 years ago. That was the first record of a Blue Jay in Oregon, by the way! The first week of November is when we see tropical kingbirds on the coast. And we are getting lots of reports. In Bandon, a Tropical Kingbird has been seen at Redmon Pond and also at the Bandon Dunes Resorts. In the Bay area, we have reports from North Bay Drive. And today alone, we have reports from up the coast at Florence, South Beach and Neatarts among others. Join us for our first meeting of the new season and our annual business meeting will be on Wednesday, October 11th at 7 PM at the Bandon Community Center, aka The Barn. You will hear about our monthly field trips, monthly programs as well as other upcoming activities such as the Christmas Bird Count, Backyard Bird Count, Black Oystercatcher Survey and North American Migration Count. We will be reporting on highlights from last year and electing our officers for 2017-8. We are also looking for people to assist us on our newsletter, website, programs, conservation projects, membership and more. We are also asking if there is a conservation goal that you would like us to carry to next month’s Oregon Audubon Council which will be developing Oregon’s conservation goals for the year. Last year, we raised saving the Elliot State Forest as a goal which was chosen as one of the statewide goals for Oregon Audubon and in the end their help was critical. For more information or to discuss helping in one of the areas listed above, you can call Harv at 541-297-2342. Our first chapter field trip of the season is Saturday, October 7th 2017. We will venture down to Curry County as migrant passerines are peaking down there. Meet at 6 AM at Coos Bay library. We will car pool as much as we can. Bring water, lunches, and rain gear. We are meeting early because we will drive south to Pistol River (south of Gold Beach, about 2 hrs. 15 minutes from Coos Bay) and try to be there shortly after sunrise to look for late migrant passerines, newly arrived sparrows, and anything out of the ordinary at one of the premiere vagrant traps on the south Oregon coast. From there we will work our way north to Gold Beach and probably Ophir (Euchre) Creek. We will probably not be back to Coos Bay until later in the afternoon. Windy weather normally shuts down the birding though, so if it becomes windy early, we may be back earlier- we'll see how it goes. It is possible to meet people at various locations along the way (Bandon, Langlois, etc.) - just contact Tim Rodenkirk a day or two beforehand so we can get a rendezvous time and place all figured out before Saturday morning! Tim's home phone is 541-269-4696 where you can leave a message. Call him direct on his cell at 541-260-5763. Join both advanced and beginning birders alike on the Southern Oregon coast this Labor Day weekend September 1-3rd to meet and hear award winning writers and photographers Noah Strycker and Paul Bannick at the 31st Oregon Shorebird Festival. Noah Strycker is a 31-year-old writer, photographer, and bird man from Creswell, Oregon. His third book will be published in October of this year: Birding Without Borders, which accounts his 2015 quest spanning 41 countries and all seven continents as he set a world record by seeing 6,042 species of birds (more than half the birds on Earth) in one calendar year. Paul Bannick gives bird-lovers a gorgeous photographic feast and an engaging natural history lesson, while making a compelling call to preserve the habitats that sustain these most iconic of birds. In his new latest book, Owl: A Year in the Lives of North American Owls, Bannick features more than 200 images captured over several years of field work. This year’s field trips will include a pelagic trip off shore, kayak paddle tours up the South Slough, land-based trips to both Bandon and the Bay Area as well as a sea watch. Oregon Pelagic Tours will host a five-hour pelagic trip on Saturday to give participants a sense of what a day-long pelagic trip is like. South Coast Tours will lead South Slough kayak paddle trips on both Saturday and Sunday. South Slough of the Coos River is home to the South Slough National Estuarine Research Reserve which is a protected area of land and estuary. The weekend kicks off with registration at the Oregon Institute of Marine Biology (OIMB) cafeteria in Charleston. OIMB is located at 63466 Boat Basin Road. "A Biologist's Dream: Wet and Wild Life of the Galapagos Islands" will be presented by CAAS member Dr. Larry Basch on May 10 at 7 PM at the Coos Bay library. From the air above, across this renowned archipelago, and under nearshore coastal waters, come and see island endemic birds, other animals and plants unlike ones you've ever seen! Open and free to the public. "70,000 carcasses, 175 species, 500 sites, and 400 people: beached bird patterns in a warming world" by Dr. Julia Parrish of the University of Washington. The seminar will be held at 7:00 pm on Friday, April 28 in the OIMB Boathouse Auditorium at the end of Boat Basin Way, Charleston (parking on road near OIMB and ODFW buildings). Help make a difference for the environment by collecting data for the Coastal Observation and Seabird Survey Team (COASST). COASST is a citizen science project dedicated to involving volunteers in the collection of high quality data. Our goal is to assist government agencies and other organizations in making informed management and conservation decisions, and to promote proactive citizen involvement and action. COASST Beached bird participants systematically count and identify bird carcasses to help determine baselines for seabird mortality along the North Pacific coast. Volunteers need NO prior experience, just a commitment to survey a specific beach (about ¾ mile) each month. If you are interested in participating, join COASST staff for the training session. There is no charge to attend the training, but plan to provide a $20 refundable deposit if you would like to take home a COASST volunteer kit. Training activities take place indoors. Beach surveys are best conducted in groups of 2 or more – please come with a survey partner in mind or plan to join a team during training. Please RSVP to attend a training by contacting coasst@uw.edu or 206-221-6893. Author Noah Strycker, the first person to find over 6,000 different bird species in a single year, will present at the Bandon Community Center, off 11th St., adjacent to the library and Sprague Theater. The Creswell, Oregon native will preview his new book "Birding Without Borders," on his experiences from around the world in accomplishing this Big Year record. Mark your calendars for March 8 for the next CAAS monthly program “India: Exotic Creatures and Captivating Culture”. This presentation is set for 7 PM and is free to the general public. From the heights of the snow-capped Himalaya’s to the steamy marshes of Rajasthan, India’s exotic birds and captivating wildlife live side-by-side with a large and diverse human population. Come and see breathtaking images of the exotic birds and mammals of India presented by Ram Papish and Dawn Harris. at the Bandon Community Center , off 11th St., adjacent to the library and Sprague Theater. Our next field trip is scheduled for Saturday, February 18. Tim Rodenkirk will lead the group birding the Coquille Valley. Tim will meet the group at 8 AM at the Coos Bay Library. For birders outside the Bay Area, Tim's group will meet you at 8:40 at Sturdivant Park in in Coquille. Bring rain gear and snacks. For those unable to get out in the field, you are encouraged to attend Shoreline Education for Awareness' seminar on Oceanography with Dr. Alan Shanks. It will be the same morning at OIMB starting at 9 am. Joe Metzler will be the featured presenter for February's program for the Cape Arago Audubon Society. His program, "Beach-combing Kayak Island Alaska" is slated for 7 PM on Tuesday, February 7 at the Coos Bay Library. Please note that this is a Tuesday, not our regularly scheduled Wednesday evening. Our next field trip is scheduled for this coming Saturday, January 14. Tim Rodenkirk will lead a trip to Empire/Charleston. Target birds will include the King Eider and Long-tailed Ducks found in the Coos Bay Christmas Bird Count. Those planning to go on the trip meet Tim at the Coos Bay Library at 8 AM. Our December program has moved from our usual second Wednesday of the month night to second Sunday night. Join local naturalist Joe Metzler for "Devil's Staircase Wilderness: Wasson Creek Journey on December 11 at 7 PM at the 7 Devil's Brewery in Coos Bay. Mark your calendars now. SEA is pleased to announce that Dr. Al Solomon, retired National Program Leader for Global Change Research in the U.S. Forest Service, will launch our new season of seminars in November. In addition to 90+ research publications, Dr. Solomon was a Contributor to the 2007 Nobel Peace Prize awarded to the International Panel on Climate Change. Dr. Solomon will present on Saturday, November 19, 2016, at 9 am in Coos Bay at the History Museum, located at 1210 North Front Street, Coos Bay, Oregon. Our November field trip will be to Floras Lake on Saturday November 13. Those who wish to participate should be to the Coos Bay Library by 7:30 AM. Those in Bandon wishing to participate should be to Ray's Food Center parking lot close to the Coffee Expresso stand at 8:00 AM. Those coming from the east can catch up with the group at either of these locations. Tim Rodenkirk will lead the trip. Our next chapter meeting and program will happen on November 9 at 7 PM at the Coos Bay Library with Joe Metzler presenting on Purple Martins. We will also have a field trip on the following Saturday. The destination will be dependent on the prevailing weather forecast as very wet weather will keep up closer to home. Shoreline Education for Awareness (SEA) invites the public to join us at our Annual Membership Meeting. Find out how you can help us in meeting our mission of educating the general public about shoreline habitat and the wildlife along the southern Oregon Coast. The meeting is scheduled for October 22, 2016, at the Bandon Community Center, or The Barn beginning at 1 PM. The President’s Year in Review, officer elections, and anticipated 2017 projects, seminars, and volunteer opportunities are some of the topics to be discussed. The annual meeting will feature a presentation by the Charleston Marine Life Center Director, Trish Mace. Afterwards, spend a little time getting to know your Board of Directors and fellow members over delicious refreshments. Your participation is wanted and needed! Also, you may want to mark your calendars now. SEA is pleased to announce that Dr. Al Solomon, retired National Program Leader for Global Change Research in the U.S. Forest Service, will launch our new season of seminars in November. In addition to 90+ research publications, Dr. Solomon was a Contributor to the 2007 Nobel Peace Prize awarded to the International Panel on Climate Change. Dr. Solomon will present on Saturday, November 19, 2016, at 9 am in Coos Bay at the History Museum, located at 1210 North Front Street, Coos Bay, Oregon. Birders in Coos County should mark their calendars for the annual membership meeting of their local National Audubon Society chapter. The Cape Arago Audubon Society will be meeting on Wednesday, October 12th at the Community Center (The Barn) in Bandon at 7 PM. This meeting is open to the public and all those wishing to get involved in birding activities in the area are encouraged to attend. Birding activities for the coming year will be discussed. This includes monthly field trips to locations throughout Coos and Curry counties as well as monthly programs on issues and topics of interest to birders. Details on planned National Audubon activities will also be outlined including Christmas Bird Counts, North American Migration Counts and Backyard Bird counts. Highlighting the evening will be feature speaker Joe Metzler presenting “Backpacking in the Elliott State Forest”. Keeping the Elliott in public ownership has been one of the primary goals of the Oregon Audubon Council in 2016. Each month’s Audubon program is followed by a Saturday field trip. This month’s field trip on October 15th will involve participation in the biannual Brown Pelican Survey taking place up and down the west coast. Attend this annual membership meeting to find out more on how you can participate. Come join fellow birders from around the county at this information packed get together. For more details, call Harv Schubothe at 541-297-2342. May's Cape Arago Audubon Society program will feature Stu Love giving a talk on the New Coquille Wildlife area. The meeting will be held at the Coos Bay library on Wednesday May 11 at 7 PM. We also will have information on a proposed Outdoor School for Everyone ballot measure as well as a report on the Oregon Audubon Council Meeting held in Bandon on April 23. Outdoor Education provides the kind of experience that can transform a child’s perception of the natural world and help strengthen their connection to the web of life in which we all exist. In recent years, budget cuts have eliminated Outdoor Education for many of Oregon’s students. Please help provide one week of Outdoor Education for every 5th or 6th grade student in Oregon by signing a petition to place the measure on the Nov. ballot. No new taxes need be enacted. Funding will be provided from state lottery money that is not already designated for state parks, salmon enhancement, etc. Outdoor Education provides children with a week-long, overnight adventure in an outdoor camp setting. Students will participate in a hands-on science curriculum designed to foster inter-personal skills and engage their interest in nature. A petition will be available for residents of Coos County to sign at the next Cape Arago Audubon meeting on May 11, 2016, at the Coos Bay Library. If you are willing to circulate a petition to help collect signatures in support of placing the measure on the ballot, please see Barbara Taylor at the meeting, or contact me at 541 756-7206 or at beetea27@gmail.com. Thank you! Brown Pelican Citizen Science Survey May 7, 5-7 p.m. The west coast Audubon network, U.S. Fish and Wildlife Service, and ebird are partnering on a new citizen science project to survey for Brown Pelicans on May 7 between 5-7 pm along Oregon's coast. To learn more about this opportunity visit: http://ca.audubon.org/brownpelicansurvey. This website includes an easy protocol to follow as well as instructional information on how to enter the survey data directly into ebird. In Oregon, 17 priority survey locations have been identified (see attached spread sheet - corresponds to map locations on the website listed above) however, surveys can be performed at other sites of your choosing as well. Ebird hotspots are still being created for this project but that will be complete by survey day. To enter your observations, you'll simply click on the green spot on the website map where you conducted your survey and at the bottom of the window will be a direct link to the ebird hotspot. This survey will help define the distribution and abundance of Brown Pelicans and track shifts in population structure. In recent years Brown Pelican productivity at the Channel Islands in California and across the range has been poor, and key forage fish species including anchovy and sardine have collapsed raising questions and concerns about recruitment to the breeding population and ultimately the health of the subspecies. Please let me know if you are interested and at what sites you would like to conduct the survey. Please feel free to forward this email to others that may be interested. Oregon Audubon Council meeting in Bandon on April 23, 2016, 5:30 p.m. The Oregon Audubon Council is meeting in Bandon on April 23. Delegates from Audubon chapters from around the state will be attending. Cape Arago Audubon is the host and we will be hosting a no-host bar (beer, wine, soft drinks) from 5:30-6:30 p.m. Anyone who is available to help me tend to the drinks will be appreciated. You can call me at 541-297-2342. After the Council's business meeting, there will be a social hour and catered dinner for the Council starting at 5:30. Again, you are invited to attend and meet the delegates from Oregon's Audubon chapters. The cost of the dinner if you choose to participate is $25.Call me at 541-297-2342 for details. A Saturday night program will follow the dinner and will feature Free Flight, our local rescue facility, that will include a couple of their live birds of prey. In addition, Eric Mruz, our local USFWS refuge manager, will be providing an update on the Bandon Marsh Refuge. The program will start around 7:00 and is free. All these events will be at the Bandon Community Center, the Barn. Evening Program Saturday April 23, 7:00 p.m. If you have attended our monthly meetings recently, I have announced that our local Cape Arago Audubon Society chapter will be hosting the quarterly Oregon Audubon Council meeting over the weekend of April 22nd to 25th in Bandon. The Council consists of two delegates from each Audubon chapter in Oregon. You are probably also aware that CAAS had to cancel its scheduled program and filed trip planned for this month. I wanted to make you aware that there is a program and a field trip associated with the Audubon Council that you are invited to and may want to take advantage of. The Saturday night program will feature Free Flight, our local rescue facility, that will include a couple of their live birds of prey. In addition, Eric Mruz, our local USFWS refuge manager, will be providing an update on the Bandon Marsh Refuge. The program will start around 7:00 and is free. Prior to the program and after the Council meeting, there will be a social hour and catered dinner for the Council starting at 5:30. Again, you are invited to attend and meet the delegates from Oregon's Audubon chapters. The cost of the dinner will be $25 and the menu is contained on the attached registration form. There is also a field trip scheduled for the following Sunday morning that will tour the Bandon area in search of shorebirds, tufted puffins, snowy plovers and anything else we can find. We will meet at 7:30 and finish around noon. The trip is free and lunches are available for $10. Again, details are on the attached form. Finally, you are invited to attend the Council's business meeting. Remember though that like all of the other chapters in attendance we will have only two designated delegates able to vote. For this all day, there is a $5 registration free and lunch will be available for $10. So we do have a program and field trip available this month. Also there is an opportunity to meet chapter delegates from the various other Audubon chapters in Oregon. If you are interested in any of this, please let me know ASAP over this weekend how many of you (including other family members) as I need to get a head count into our caterers so they can hire an appropriate number of help and order sufficient food. Just send me an e-mail response indicating what you would like to take part in and whether you are interested in any of the meal choices. Black Oystercatcher Seminar and Field Trip Saturday April 16, 9 a.m.
Our April program is cancelled as our scheduled speaker had a conflict. However, we encourage you to check out the Black Oystercatcher seminar and field trip being sponsored by Shoreline Education for Awareness on April 16. Also, the Oregon Audubon Council is being hosted by our chapter on April 23, 24 and 25th. Our members are invited to their Saturday night program on April 23 that will feature Free Flight and the Birds of Prey. Details on the latter are forthcoming. Are you interested in finding out more about the Black Oystercatchers that frequent and breed in our area? Join Shoreline Education Awareness on Saturday, April 16th, for another of its 2016 seminar series beginning at 9 AM at the Bandon Library. Diane and Dave Bilderback have been leading Black Oystercatcher reproductive surveys in Bandon for many years and will be presenting at the seminar. The Bilderbacks will be focusing on Black Oystercatcher behavior and will be sharing results from the 2015 and earlier reproductive surveys. Following their presentation, Diane and Dave will be taking seminar participants out into the field to share and help locate previous breeding sites on the rocks off Bandon’s beaches. Doors will open at 8:30 AM for registration. Pre-registration is not necessary. The seminar is free for Shoreline Education for Awareness members! A $5 donation for non-members is recommended. Snacks and coffee/tea will be available. More information is available by calling SEA at 541-260-7770. Shoreline Education for Awareness is always looking for more volunteer wildlife interpreters. Should you be interested, please join us at this seminar to learn more about opportunities and about this bird species in particular. Also mark your calendars for Saturday, April 30. From 10 AM to 1 PM, Shoreline Education for Awareness will be having its annual Tufted Puffin Party at Coquille Point. You are invited to the 8th annual Sharing the Coast Conference, coming to Coos Bay March 4-6. The public is welcome to share in the wealth of information about coastal science and natural history that the conference provides. The event takes place at Southwestern Oregon Community College (1988 Newmark). A collaboration between the CoastWatch program of the Oregon Shores Conservation Coalition and the Northwest Aquatic and Marine Educators (NAME), the conference features speakers on topics ranging from oceanography and undersea exploration to beach ecology and climate change. Workshops and field trips will introduce a still wider range of subjects and skills. You will find the full schedule online at http://oregonshores.org/pdfs/SharingTheCoastSchedule2016.pdf. Registration is open online, http://tinyurl.com/sharingthecoast2016, or by downloading the form (http://tinyurl.com/2016sharingthecoast) and mailing a check. It will also be possible to register in person at the conference. Keynote speaker for the Friday evening (March 4) “community talk,” which is free and open to all, is Fritz Stahr, who manages the Seaglider Fabrication Center at the University of Washington’s School of Oceanography. Stahr will describe his experiences in studying the ocean through the use of ROVs (remotely operated vehicles), and in introducing students to marine science. Dr. Stahr’s talk takes place in the Hales Auditorium on the SOCC campus, beginning at 7 p.m. This event is co-sponsored by the SOCC Geology Lecture Series. · Ecologist Steve Rumrill, who will explore Oregon’s bays and estuaries, with special attention to the shellfish they sustain. In addition to the plenary presentations, the Saturday and Sunday schedules will be packed with workshops on such topics as marine mammals, tidepool life, marine debris, “beached marine critters” (from squid to sharks to sea turtles) and sessions on teaching marine science aimed at teachers, interpreters and docents. Field trips will explore both outer shorelines and the nearby estuary. The The conference also includes a Saturday evening party, which features an informal talk by Bill Hanshumaker, chief Sea Grant scientist at the Hatfield Marine Science Center, on the role of noise in the ocean, as both a natural effect and a human impact, along with food, drink and a coastal trivia contest. Conference fees are $25 for current members of CoastWatch, Oregon Shores and NAME, $45 for members of the general public (who are invited to join either sponsoring organization and take the discount), and $20 for students. The fee includes Saturday lunch and the Saturday evening party. Fee for Sunday only is $15 (lunch on your own). For more information, visit the CoastWatch website, http://oregonshores.org/coastwatch.php5. A full schedule will be posted there. Or contact Fawn Custer, CoastWatch volunteer coordinator, (541) 270-0027, fawn@oregonshores.org. In its effort to take its programs throughout Coos county, the Cape Arago Audubon Society will be bringing its March meeting to Coquille. The Society will meet at the Coos County Annex at 201 Adams Street at 7 PM on Wednesday, March 9. The program will feature internationally published wildlife photographer Steven Holt. His presentation will be a mix of stills and video that he has taken over the years at Malheur National Wildlife Refuge, in commemoration of the return of the refuge to the birds and the people who love them. He will discuss the wildlife of Malheur and the broader movement to privatize federal lands in the west. The Cape Arago Audubon Society is the local Coos county chapter of the National Audubon Society with monthly programs at various locations throughout the county. These are followed with monthly field trips to birding hotspots throughout the area and beyond. It also works on restoring and maintaining bird habitat throughout the county. For more information, call Harv Schubothe (541) 297-2342. Cape Arago Audubon Society will have a field trip on the Saturday February 13 following our Wednesday night program, this time to the Coquille Valley. Tim Rodenkirk will meet interested participants at the Coos Bay library at 8AM and hopefully do some carpooling. Waterfowl hunting season will be over and we should see lots of ducks and raptors. We will also look for the Prairie Falcon that was found on the Coquille Valley CBC and see what else we can find. Bring rain gear, binoculars, a scope if you have one, and snacks/lunch. We will probably be gone until at least noon, maybe 1PM or so. For those who want to meet Tim in Coquille you can rendezvous at Sturdivant Park about 8:30AM. Tim will be undergoing knee surgery at the end of February, so no field trips have been planned for the next couple of spring months. However, Shoreline Education for Awareness will be conducting monthly seminars on Audubon's normal field trip days. This will include marine mammals, Black Oystercatchers and Snowy Plovers with field trips attached to the seminars. Updated information will be forthcoming. Ram Papish is nuts about puffins, and you should be too! Join the Cape Arago Audubon Society for its monthly program on Wednesday, February 10 at the Community Center (The Barn) in Bandon at 7 PM for A Passion for Puffins. Tufted Puffin is one of the most colorful and charismatic bird species of the Oregon Coast. Ram Papish will talk all about puffins and read his upcoming children’s book “Puffling.” He will reveal secret techniques for creating illustrations and share many dramatic puffin photographs from Alaska and Oregon. The presentation is for both children and adults. An artist/ biologist/author, Ram has been part of several research projects involving Tufted and Horned Puffins. He has held, and been bitten by, many a puffin and its chick. Ram is president of Yaquina Birders and Naturalists. His honors include finishing second-runner up in the 2009 Aleutian Beard and Mustache Contest. He lives near Newport, Oregon with his fabulous wife, Dawn Harris, 18 chickens, two parrots and one Chia pet. The Coquille Valley CBC, including Bandon, is conducted annually on the first Saturday in January, the 2nd, 2016. We generally have the second highest number of species in Oregon following Coos Bay. Harv Schubothe is the compiler and everyone is invited. Experienced leaders who have led teams in one of the twelve areas in the circle in the past are assigned to lead teams in one of the areas again. All other participants from beginner to intermediate to advanced birders are then assigned to each of the teams. Again, the effort is a day-long commitment from dawn to nearly dusk. For those unable to get out in the field, it is possible to count birds in the yard or neighborhood. Those interested in participating can contact ninerharv2@msn.com. The Curry County - Port Ordford Area - Christmas Bird Count led by our sister Kalmiopsis Chapter Audubon will happen on Sunday 3 January, 2016. Contact Tim Rodenkirk timrodenkirk@gmail.com or Ann Vileisis annvil@earthlink.net beforehand for info. Shannon Souza will be the presenter on this restoration project in the Catching Slough area. Ms Souza is a designer of alternative energy systems for Sol Coast. Shannon specializes in alternative energy system design, water rights examination, and project management. THINK WINTER IS TIME TO SLOW DOWN, ADVENTURE FROM YOUR ARMCHAIR, AND DREAM OF WARMER WEATHER OUTINGS? THINK AGAIN! THERE ARE A LOT OF GREAT BIRDING AND RELATED ACTIVITIES HAPPENING ON AND NEAR THE OREGON SOUTH COAST IN THE NEAR FUTURE! CHECK OUT THESE ACTIVITIES, AND MARK YOUR CALENDARS NOW! Two spaces open (as of 11/22)- hurry! For more information: www.umpquaaudubon.org. The Cape Arago Audubon Society begins its regular second Wednesday meetings on December 9, 2015 at the Coos Bay Library at 7 PM. Our first program will be “Birding Tanzania: A Small Part in A Big Year” featuring Harv Schubothe and Kelle Herrick. Harv and Kelle will be sharing their adventures in Tanzania where they joined Noah Strycker in his 2015 year-long quest to find 5,000 different bird species in his travels around the world. Noah and Harv encountered 387 different bird species in Tanzania and many are captured in Kelle’s spectacular photography. The Cape Arago Audubon Society is the local Coos County chapter of the National Audubon Society with monthly programs at various locations throughout the county. There also are monthly field trips to birding hotspots throughout the area and beyond. We also work on restoring and maintaining bird habitat throughout the county. Our next CAAS Birding field trip is Saturday Dec 12. Join us for a fun time! Meet at 8:30 AM at the Millicoma Marsh or 8:00 AM at the Coos Bay Library parking lot SW corner to carpool. The gravel road is not recommended for parking. Instead park above the Marsh. For directions or other info, see above link to Local Birding, or call Tim Rodenkirk 541-269-4696. The Pacific Flyway Shorebird Survey (PFSS) is looking for citizen science volunteers to conduct shorebird surveys. The Pacific Flyway Shorebird Survey is a multi-partner project, led by Point Blue Conservation Science; the survey depends on citizen science effort to help protect shorebirds and wetlands all the way from Canada to Mexico. This year Klamath Bird Observatory is assisting with the coordination of surveys at Coos Bay, Oregon. 2. Scout: Become familiar with your site; make sure you know the access points and how long it will take to cover the area. 4. Data Entry: Surveyors will enter their data online into the California Avian Data Center. 6. Have a passion for and dedication to shorebird conservation. For more information about PFSS please visit www.prbo.org/pfss. If you would like to participate or have any questions please contact Ellie Armstrong, at eea@KlamathBird.org 541-201-0866 ext. 5. (at the SW corner of NW Stewart Parkway and Renann St. between Del Taco and McDonalds). 7:00 pm open sharing time (stories, sightings, photos, video, artifacts, journals, art, quizzes, questions) UVAS has acquired a new projector so looking at photos and video is much more enjoyable! 7:30 pm Christmas Bird Count Refresher for the Roseburg/Sutherlin CBC Dec. 19th. Even if you are unable to participate in the CBC, everyone is welcome for this review of our local winter birds! We are encouraging people to bring in bird-related books or other literature to give away or share. There will be free Oregon Birds magazines. If you would like to borrow a beginner spotting scope contact Matt Hunter at matthewghunter@gmail.com. You may bring something to eat or drink for yourself and/or to share if you like. No red, carpet-staining liquids, please. Questions? Call Matt Hunter 541-670-1984. There will be two Christmas Bird Counts (CBCs) in Coos County this year. The first, on Sunday, December 20, is the Coos Bay CBC which includes the Bay Area through Charleston and the South Slough. The second, to be conducted on Saturday, January 2, is the Coquille Valley CBC which includes the area between Bandon and Coquille going as far north as 7 Devils Road. The Coos Bay count is done biannually and is being conducted this year on Sunday, December 20. Tim Rodenkirk is the compiler for the count that generally sees the largest number of species of all the counts done in Oregon. While the CBCs are open to all, Tim generally encourages beginners to come on his monthly Cape Arago Audubon field trips first; these are slower-paced and easier to learn birds on rather than on the CBC day. The CBC is an all-day rain or shine event. We expect participants to hang in there and do their area regardless of weather conditions (otherwise areas of the circle would be overlooked). Because of the large area each group tries to cover, it is pretty fast paced and with not much time for beginners to figure out which bird is which. Tim always has an open invitation to come on field trips that he leads for Cape Arago Audubon - generally the Saturday after our monthly meeting (rain or shine). Tim can be reached at garbledmodwit@yahoo.com. Help out this citizen science project by taking a photo of King Tides -- the most extreme tides of the year-- at the highest point on these days. Such photos can help more people grasp the significance of the increased tidal surges that are expected to become far more common with climate change. Photos that show the location of the tide in relation to the built environment (roads, seawalls, buildings) are especially useful in demonstrating impending threats. The ideal photo would be taken from a location where the photographer can return later at an ordinary high tide to take a comparison shot. Participants can post photographs online through the King Tide Photo Initiative website, http://www.oregonkingtides.net/ where project information and the online submission form can be accessed. Be prepared to include the location, date, description, and direction of the photo. Birders in and near Coos County should mark their calendars for the annual membership meeting of the local National Audubon Society chapter. The Cape Arago Audubon Society will be meeting on Wednesday, November 11th at the Community Center in Bandon at 7 PM. This meeting is open to the public and all wishing to get involved in birding activities in the area are encouraged to attend. Come join fellow birders from around the county at this information-packed get together. For more details, call Harv Schubothe at 541-297-2342. The Cape Arago Audubon Chapter field trip for this month will be this Saturday on the north spit of Coos Bay. Tim Rodenkirk will lead the trip, meeting at 8 AM at the Coos Bay library. We will bird until about 1 PM and will bird a bit around other areas of Coos Bay weather permitting. Bring snacks, water and rain gear. Learn about the California Condor - Thursday April 30, 7 pm. The Cape Arago Audubon Society will host a presentation at 7p.m. on Thursday April 30th by Susan Haig, PhD, senior scientist for the U.S. Geological Survey, on efforts to save the California Condor. This program will be held at the Coos Bay Library. Originally found along the entire west coast and beyond, the California condor disappeared from Oregon in the early 1900s. Only a captive breeding effort has saved the species from extinction. Condors are very social and excellent parents. The current wild population of about 200 birds is intensively managed by wildlife biologists and vets. This intense handling is due to the birds needing to be chelated at least once a year to remove lead from their bodies, largely from lead bullets used in hunting animals that the birds then consume as carrion. A blue ribbon panel commissioned by the U.S. Fish and Wildlife Service and the California Audubon Society concluded that lead must be greatly reduced in order for the birds to survive a reintroduction to Oregon. The talk by Dr. Haig will cover these topics and efforts to bring the birds back to Oregon in the next few years. Haig is a senior scientist with USGS, a professor of wildlife ecology at OSU, and a research associate of the Smithsonian Institution. She directs research projects on recovery of endangered birds as well as recovery of Great Basin wetlands. She recently completed a term as president of the American Ornithologists’ Union, the oldest and largest professional ornithological society in the western hemisphere. The event is free and open to the public. Tim Rodenkirk will lead an EARLY field trip to Powers and Coquille on Saturday, May 2. This is great timing for spring migration in Coos County, but the best birding is between dawn and 10 AM. So we will meet at Coos Bay Library at 6:30 AM to carpool. if you want to go on the field trip and you live near Hwy. 42 between Coos Bay and Powers, we can arrange to meet up with you on the way. Call Tim (541 260-5763) by April 30 to make arrangements. Godwit Days, April 15-21: Travel south to Arcata/Eureka, California, in April to take part in this very popular annual birding event. It's a birding extravaganza, with something for everybody, but it fills up fast. Go to Trip Reports for an account of last year's events plus info on highlights for 2015. Or go to http//:godwitdays.org to sign up now. REMEMBER: first Saturday of every month, the South Slough Reserve leads birding outings either in the Charleston area or at the reserve. Check their website for details. Noah Strycker's Big Year: You've heard of Big Years. But maybe you haven't heard of this version, in which avid birder (I don't know, does avid even begin to describe it?) Noah Strycker is on a voyage around the world to see 5,000 species of birds (yes, that's five thousand) in their natural habitats. You can follow him on his blog at audubon.org.